Featuring 28 acres of woods trails and river Goldberry Woods Bed and Breakfast is located just 1 mile away from the beaches on Lake Michigan in Union Pier. Free WiFi access is available. Every room in this 8-bedroom bed & breakfast provides a private bathroom with a two-person spa bath artisan bed frames made of local wood a fireplace and flat-screen TV with satellite channels. Pet-friendly cottages offer views of the surrounding nature along with an enclosed porch barbecue facilities and a fireplace. This bed & breakfast features farm-to-table ingredients from our fields or nearby farms. Guests can enjoy an array of local wines and snacks at the propertyâ? 's evening social hour. A communal lounge with couches plush lounge seating and board games is offered on-site. Complimentary kayaks canoes and bicycles are available at the property. 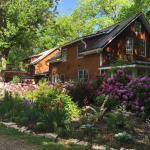 Goldberry Woods Bed and Breakfast is 56 km away from South Bend and a 20-minute drive away from Michigan City. Guests can take a 90-minute drive along the Lake Michigan lakeshore to downtown Chicago.